Former Liverpool and England striker Michael Owen admits he did not acknowledge the pressure he played under until he looked back at his career from the safety of retirement. Manchester City manager Pep Guardiola has challenged title rivals Liverpool to respond after they went top of the Premier League for the first time in two months. Liverpool striker Rhian Brewster is determined to repay the faith of Jurgen Klopp by proving himself as genuine first-team option and having a long-term future at the club. Liverpool manager Jurgen Klopp has been asked to provide written observations to the Football Association over his comments about referee Kevin Friend, Press Association Sport understands. Liverpool manager Jurgen Klopp has warned his team they will face tougher tests than Monday’s at West Ham before the end of a season in which they hope to be crowned champions. Ilkay Gundogan has happy memories of winning a league title under Jurgen Klopp – but is determined to deny his old boss this year. Liverpool manager Jurgen Klopp admits midfielder Naby Keita has plenty of improvements to make but he is not concerned by his slower-than-expected adaptation to English football. Liverpool manager Jurgen Klopp admits they cannot hope to coast to the Premier League title beating every side in their way. Liverpool failed to take full advantage of Manchester City’s slip-up in the title race as they were held to a 1-1 draw at home to Leicester. Liverpool manager Jurgen Klopp expects to go toe-to-toe with Manchester City until the bitter end of the title race irrespective of who has the advantage in the fixture schedule. Glasgow Rocks’ miserable run continued on Sunday when they slipped to a 10th successive defeat in the BBL final. Jurgen Klopp insists his players will welcome the help from new signings rather than fear competition. Liverpool have been drawn against Italian side Roma in the semi-finals of the Champions League. 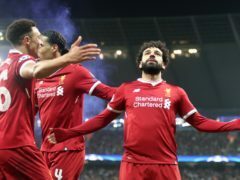 European heavyweights Real Madrid and Bayern Munich are the big-hitters in Friday’s Champions League semi-final draw but Liverpool manager Jurgen Klopp does not under-estimate surprise package Roma. Former Aberdeen FC goalkeeper Danny Ward could be sent out on loan again - just four months after his loan spell with the Dons was cut short.